Google 2009 image of The Beresford Inn, 9 Cumberland Street, Devonport. In the 2004-2005 season The Beresford Inn sponsored rugby player Stuart Friswell of the nearby Plymouth Albion team. 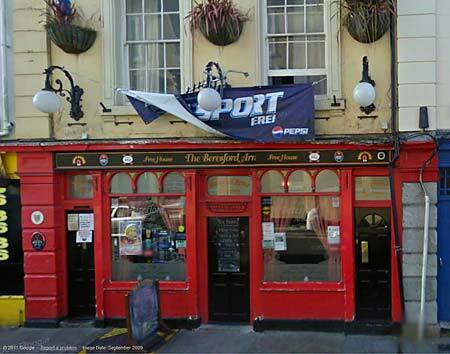 In spring 2009 the new landlady of The Beresford Inn was Georgina Morgan. Following complaints about noisy revellers drinking and fighting in the street outside the premises, Georgina said she had introduced tough new rules for staff and customers to stop people taking their drinks outside. In August 2009 regulars at the pub staged a 24-hour party and raised around £1,000 for Archie Barton, a three-year- old boy with artificial legs. Archie lost both legs and a number of fingers to septicaemia when he was 18 months old, following meningitis. According to newspaper reports the Landlady Georgina Morgan said the real star of the show was one of the pub's regulars, Roy Parker. 71-year-old Roy not only helped organise the fund raising party, he also outshone the younger revellers by completing 100 sponsored press-ups in four and a half minutes. As do most of the remaining public houses in Devonport, The Beresford Inn often raises funds for charity and funds have been contributed to such as.... Devon Air Ambulance, Help for Heroes, Archie Barton and Navy Days.